On September 29 I rode the Santa Cruz 600K brevet. I cycled alone and finished in 26:26, a bit longer than I had hoped, but not bad considering I’d spent two days at home with the flu the previous week. My GPS track is here, and the organizers posted a write-up here. Save for busy urban stretches through greater Santa Cruz and Marina, the course was lovely. Northbound on Highway 1 in pre-dawn darkness, I could smell the ocean and sometimes catch a glimpse of the surf, a ribbon of silver against an otherwise black coastline. Sunrise found me climbing above the fog on Cloverdale Road. By lunch time I was in the redwoods, enjoying the shady climb up Haskins Hill. Tailwinds and golden sunshine welcomed me to the Salinas Valley, gentle rollers across gorgeous farmland. Dusk turned the eastern mountains purple, and a full moon rose behind them, and then stars appeared overhead. It was Saturday night in a land of Latino farm laborers: mariachi blasted from roadside barns, and vintage lowrider convertibles cruised through a gas station in King City while I refilled my water bottles. The night brought cold, and the cold brought surreal patches of ground fog that only thickened as I returned to the coast. For a couple hours I saw little more than a grey cone of mist in my headlight. But conditions improved in the last few miles, and I rolled into Santa Cruz along empty streets just as the sun rose behind me, a memorable end to a beautiful ride. So this was in many ways a great ride. What I really want to write about, however, is not the ride itself, but what it showed me about how we treat our land and the people who work on it. Food production is a complex subject, and authors such as Michael Pollan already have explained the issues better than I can. But I do want to share what I saw in a full day of cycling through some of America’s most fertile farmland, the source of almost half of all strawberries eaten in the United States. In Watsonville (McGowan Road, mile 159.4) a tractor was fumigating strawberries. The driver wore a full-body white hazmat suit with an integrated face mask and respirators. He stopped the tractor when he saw me coming, and I held my breath for a hundred yards, but just a whiff of the stuff, sweet but also pungent like ammonia, was enough to start me coughing. Not far from the tractor, maybe a hundred yards away, hispanic men worked the field with their bare hands and nothing more than hoodies for protection. In the Salinas Valley, for many miles along County Road G17, signs like this one warned against entering the fields. “Danger - Pesticide - Do not enter - Peligro - Pesticida - No entrar”. Miles and miles of broccoli and lettuce and berries, all toxic. And just as in the photo, laborers with no protection harvested the plants. In some places, such as along Bluff Road in Watsonville (mile 161), fields labeled “Organic - Do not spray” were separated from ones labeled “Danger - Pesticide” by tall plastic tarps. In other places, notably south of Salinas, nothing but the narrow county road separated the “organic” area from pesticides. Even on Sunday, workers were in the fields before 6am. Old school buses with flashing hazard lights idled by the side of the road and disgorged into the cold foggy darkness scores of Spanish-speaking men. The most common strawberry fumigant was (and in much of California still is) methyl bromide, an invisible, odorless, corrosive, cancerogenic neurotoxin. Air filters are ineffective against it: handlers must use supplied-air respirators. It was scheduled to be phased out because of its ozone-depleting properties, but remains in use in California under a UNEP critical use exemption. Approximately 200 tons of it were sprayed on strawberries in Santa Cruz county last year. A common alternative to methyl bromide for fumigating your strawberries is chloropicrin. Exposure of a few seconds to 15ppm causes injury to the respiratory tract. It was first employed as a chemical weapon in World War I. Yet another common pesticide, applied broadly to many crop types, is metam sodium. In 2007, US farmers used 25,000 tons of it. The safety instructions on the MSDS are so complicated that I wonder how often they are followed correctly. Agricultural employers are not required to provide material safety data sheets to their employees. The California Department of Public Health does not seem to provide material safety data sheets in Spanish. (If they exist, please let me know and I’ll be happy to stand corrected.) Instead, what I found were generic and somewhat dumbed-down instructions about pesticide safety. Approximately 1% (~20K of 2M) of US agricultural workers each year are diagnosed with pesticide poisoning. I suspect many more go unreported due to language barriers, fear of termination, and general lack of healthcare. For comparison, the total rate of wounded and KIA in Operation Iraqi Freedom was 3.5% per year. In other words, the chance of being poisoned while farming is comparable to that of being injured while on active duty in a major military conflict. Apparently, even some of California’s organic growers buy their plants from nurseries that do fumigation. It’s not clear what the rules are for separating conventional and organic crops on large-scale farms. On a positive note, the California Department of Pesticide Regulation (DPR) has convened a working group to develop “practical and cost-effective” ways to grow strawberries without soil fumigants. I love cycling in part because it teaches me so much about where I live. Topography, sights, smells, weather: on a bike the world is all around you intimately. Sometimes you see more than you bargained for. It’s good to learn where your food comes from and to find local, small-scale farmers whom you can trust. Consider joining a CSA. There is no free lunch. Environmental degradation and sick farm workers probably are not factored in to the low low price of those flawless berries at the local Save Mart. 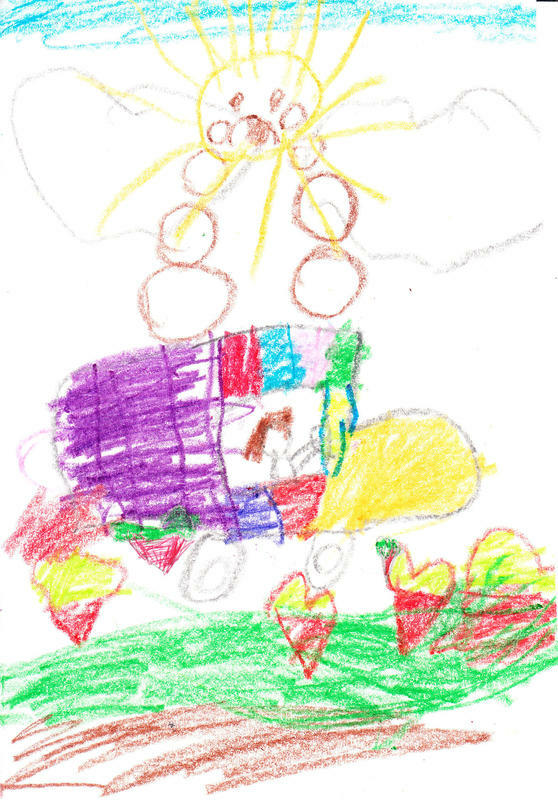 After the ride I explained some of these things to my five-year-old daughter Marilisa, and she drew this — the sun crying while a tractor sprays strawberries. Ouch.